Viktor "Isildur1" Blom mysteriously disappeared from Pokerstars for exactly three months, but the Swedish phenom recently reappeared and is back with a vengeance. Since returning a few days ago, Blom has been extremely active in the high stakes PLO games on Pokerstars, battling everyone from Phil "MrSweets28" Galfond to Brian "aba20" Townsend to "VietRussian". 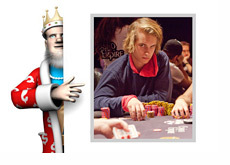 In his first full weekend back on Pokerstars, Blom netted a little over $1.5 million. On Monday, Blom gave a good chunk of that money back (about $775k) to the likes of "Jeans89" and "long90110". A $1.5 million upswing followed by a loss of nearly $800,000? That's just "Isildur1" being "Isildur1". According to HighStakesDB.com, "Isildur1" is now up $1,113,776 in 2011 on Pokerstars. This profit has come over a total of 372,818 hands and 3,390 sessions.